Tagline- They Invade Your Body. Control Your Mind. Released in 1980 Contamination also goes under such titles as Alien Contamination and Toxic Spawn. 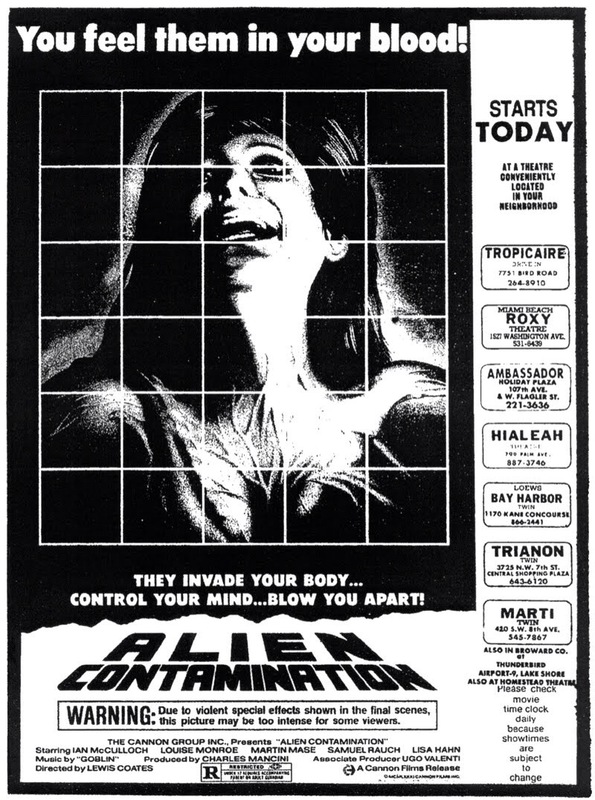 Contamination was released in the US in 1982 by the Cannon Group in an edited version under the title Alien Contamination, which is the version I saw on a DVD set released by Mill Creek with 19 other films. I hate to judge an edited version as this runs at 84-minutes and the copy was taken from an old VHS and the end credits are actually removed. Blue-Underground released this under the Contamination title with a running time of 95-minutes, which is the full uncut version. From what I can gather the version I saw most of the cuts are revolving a romantic subplot as well as a couple of scenes to tighten the pace with a couple of cuts to secure an R-rating. Taking all that into account I suppose its not fair to fully judge the film, but quite honestly my biggest issue with the film was it was boring and if I was bored out of my skull with an 84-minute running time I can only imagine how much more bored I’d be with an 11 extra minutes tacked on. The gore level in the cut version is fairly decent actually and its not extremely censored like say My Bloody Valentine was. The gore here while nothing special is again fairly decent and even if the uncut version has a little more I cannot see it making the film any better since it wasn’t the gore I had an issue with. Unless the 11-minutes cut were all action scenes I don’t think I’m missing much if I’m being totally honest here. Contamination has built up quite a cult following and I really can’t see why. There are cult films out there that I may dislike, but can easily see why its a cult favorite, but with Contamination I’m not sure why. I suppose seeing a better version in terms of audio and video and seeing it uncut could make a difference, but I highly doubt it since the VHS quality obviously isn’t good, but watchable and again I go back to even if some of the gore was cut its still decent and my issue was simply being bored and 11-minutes more well odds are I’d be even more bored than I was with the shorter running time. I was actually quite excited to see this since I love alien invasion films for the most part. The first 2 Invasion of the Body Snatchers are among my all time favorites (also liked the 3rd version Body Snatchers) and I also love the Faculty and They Live. Contamination is a knockoff of Alien, but just because a film is a knockoff doesn’t mean it can’t be fun as in the horror genre many upon many films were nothing more than clones of more popular films. 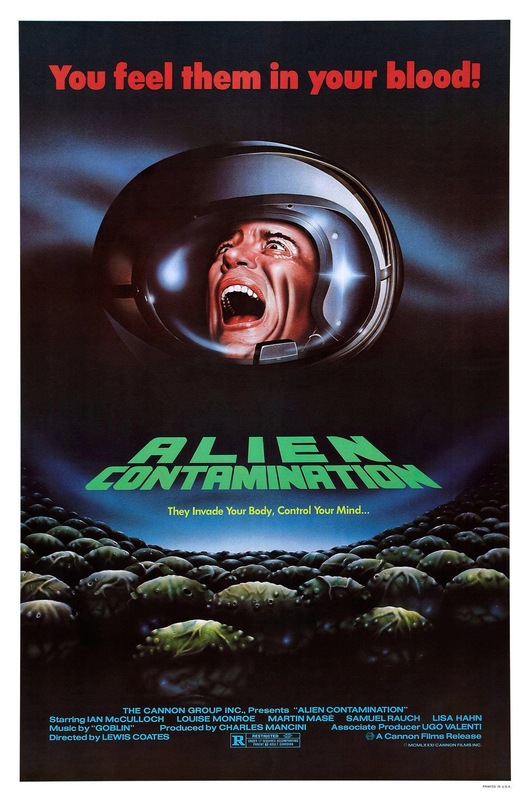 Contamination had the potential to be a fun Alien knockoff European style, but its just a bad film or better put a boring film. The basic plot also might sound a little like Invasion of the Body Snatchers, but they’re actually nothing really alike. A maned mission to Mars brings back some sort of alien life that is able to take over the bodies of people on the earth. The screenplay was written by Luigi Cozzi under the name Lewis Coates and was co-written by Erich Tomek who wrote the 1981 slasher film Bloody Moon directed by Jess Franco. The script by Cozzi & Tomek is poorly plotted filled with very dull and lifeless characters. Knockoff or not the plot does have the makings of a fun time, but its very much devoid of any of that. The script isn’t so bad as its just not interesting and filled with boring scenes of talk. As director Luigi Cozzi crafts a film that’s quite sluggish in pacing despite only running at 84-minutes. When there is action it’s fairly effective even if cuts were made for the R-rated version. Regardless there isn’t nearly enough action and the film isn’t strong enough to rely on characters or story. The only other film I’ve seen by Cozzi is The Killer Must Kill Again, which was very Argento inspired (Argento is Cozzi’s mentor) and the film had a terrific cast with George Hilton, Antoine St. John and Cristina Galbo. I liked the film the first time around, but for me didn’t quite hold up. Since I’ve only seen two films by Luigi Cozzi so I don’t know a whole lot about him, but while Killer Must Kill Again was effective enough, Contamination is just a boring mess with poor pacing and little to no suspense. Contamination doesn’t even work on the so bad its good level as it isn’t a bad film per se. This isn’t very good filmmaking, but its a competently made film and really the word I keep going back to is boring. You know you’ve seen one too many Italian horror films when you recognize actors from various other roles. Ian McCulloch is one of the stars and he’s best known for appearing in the Lucio Fulci classic Zombie as well as the trashy fun Zombie Holocaust. Another notable face was Carlo De Mejo who appears in a small role and like McCulloch has also worked with Fulci on such films as City of the Living Dead and House By the Cemetery. Overall I found Contamination to be a complete bore and I struggled getting through the 84-minute running time and have no real desire to see the uncut version unless I can get it super cheap. There have been films I’ve seen in very poor editions that I liked more when I saw a better edition and there’s been films I saw R-rated and liked more in the uncut form, but the difference is I already liked those other films in versions I saw, but I really can’t think of much I liked about Contamination so I just can’t foresee my opinion changing upon seeing a better and uncut copy. As I stated I hate to judge the film based on the version I saw, but again I didn’t see anything that would change my mind. I would only recommend this due to its cult following as others may feel differently than I did.